Making the first ceremonial pitch is a big part of American baseball culture; and the honour is usually reserved for presidents, dignitaries and rock stars. 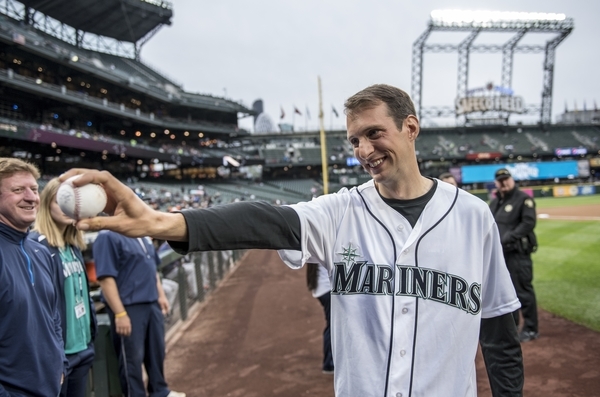 However, it was Visit Seattle Skipper Huw Fernie’s turn to be a rock star this evening as he stepped up to make the first pitch at the Seattle Mariners game at the Safeco Field Stadium, the team’s home ground. The sport is America’s pastime, and Huw had been practising for weeks in anticipation of the big moment, even practising with throwing oranges into the water on board his yacht at sea. After some last minute practice in the stadium, Huw made the first pitch to infielder Luis Sardinias before the game against the Houston Astros started. Cheers of support could be heard from the stands, where many Clipper Race crew are watching the game alongside Mariners fans. 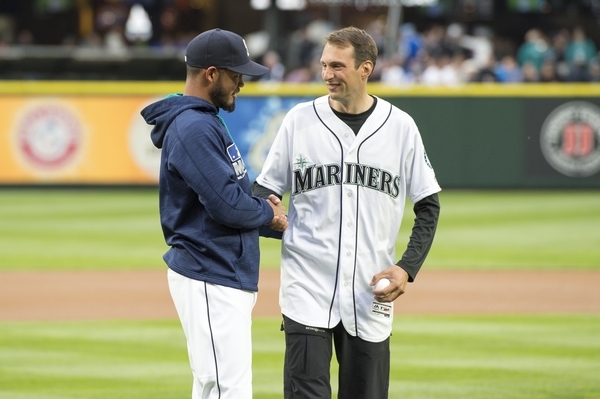 Ralph Morton, the Executive Director of the Seattle Sports Commission, a team partner of the Visit Seattle yacht and the organisation who arranged for the first pitch to go ahead, commented on Huw’s pitching technique. 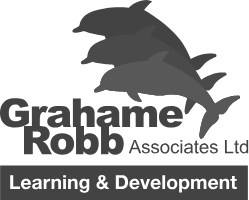 Ralph said: “He really utilised all of the plate and made a great pitch. Using all the strike zone, it was a perfect strikeout pitch. He had a lot of fun out there and was quite the athlete. “We are very proud to have witnessed the moment,” Ralph added. Following the pitch, Huw and his family then went in the stand to watch the game with the Clipper Race crews. Watching her skipper as he switched from surf to turf, Visit Seattle crew member, Emily Bambridge said: “It was brilliant to see Huw up there, we all know how hard he has been practicing with coaching from Kevin Ticen at the Seattle Sports Commission and using every spare moment to prepare. I have never been to baseball before and it’s very cool, the crew are soaking up the American sporting atmosphere watching the game and taking a tour of the stadium too. To see the footage of Visit Seattle racing across the Pacific playing on the big screen gave me goose bumps too, I am so glad that I decided to do the race and its fantastic being in Seattle as a crew member from the team." 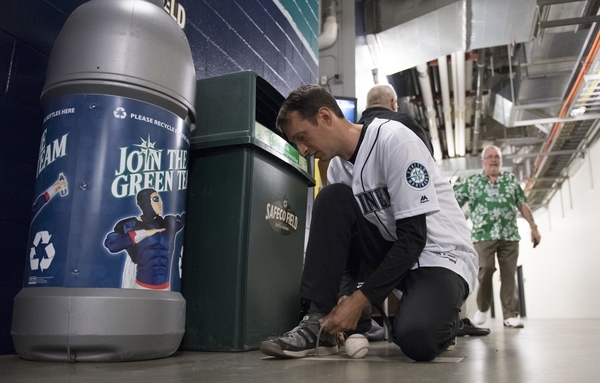 Prior to the game, he had also been greeted by the Mariners Moose mascot, and been interviewed in the dugout by ROOT Sports TV network who broadcast the games. For a full gallery of images of the event, click here. For a Periscope replay of the pitch, click here.